On January 4th, 2008, my husband and I welcomed a beautiful baby boy into this world. We were all so happy. It wasn't until 4 months later that we became concerned about our son Canaan. He wasn't growing like he should and he started having other complications. His pediatrician and a team of doctors from Arkansas Children's Hospital in Little Rock were stumped as to what was harming our son. After several stays at Arkansas Children's Hospital and numerous tests, Canaan was finally diagnosed with a rare genetic disorder called Chronic Granulomatous Disease, or CGD. He was four years old. CGD causes the patient to be unable to fight off any kind of bacterial or fungal infection. Canaan's doctors prescribed him medication and he started thriving, but the only cure was for him to under go a Bone Marrow Transplant. Otherwise, his life expectancy would be 20 years, and he would suffer a lot of complications. In June of 2013, we received a call from his doctor at Arkansas Children's Hospital. She told us about Texas Children's Hospital in Houston and how they did Bone Marrow Transplants for CGD children. We decided it would be best for Canaan to come to Houston so he could have a chance to live a long, healthy life. On October 20th, he was admitted to Texas Children's Hospital and on October 30th, he received his first bone marrow transplant. It was hard, but things were going well. As his discharge date grew closer, my husband and I became more concerned about where Canaan and I would be staying. You see, we live in a small town in Northwest Arkansas about 600 miles away from Houston. We were so relieved when we were told there was an apartment available for us. When we arrived at the Belmont, all the staff were very helpful. When we went to see the apartment that His Grace Foundation provided through the generosity of CWS Housing, we were speechless. It was beautiful, clean, and had so much room. Canaan fell in love with it immediately. We feel extremely safe here and have met some really nice people. Words cannot express the gratitude we have for all the people involved in providing this apartment for us. We have had to be in Houston longer than we expected due to Canaan's body rejecting his first bone marrow transplant, but we are so thankful that we have been allowed to stay in this apartment, which we call our home away from home, for so long. Canaan loves to swim, so the pool has been great for him and us. Canaan also loves baseball, basketball, and the Avengers. 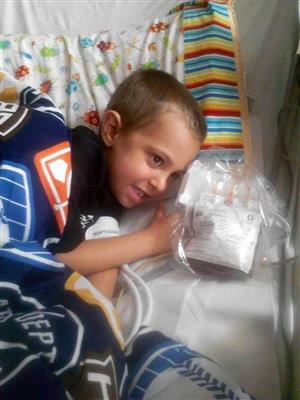 We call him "Our Little Hero" because he always has a positive attitude and is a fighter. He loves people no matter their age, and anyone who has met him would say he is wise beyond his years. In closing, I want to thank everyone who has helped us during this very scary and trying time. Canaan was admitted for his second Bone Marrow Transplant on July 29 and it was successful, although he continues to undergo treatment for various complications. We have faith in our Lord that he will be healed once and for all.